Note: All references cited are included at the beginning of each section, as opposed to traditional AMA formatting, to take advantage of the interactive footnote capabilites of Wikidot.com. Sacroiliac joint dysfunction is a controversial term used to explain pain resulting from biomechanical abnormalities of the sacroiliac joint when no evident sacroiliac joint injury is present. According to a 2003 study by Laslett et al, "The sacroiliac joint (SIJ) may produce pain in the back, buttock, groin and lower extremity similar to patterns from other lumbosacral sources." SIJ dysfunction is often difficult to diagnose, but it may be the cause for up to 30% of all chronic low-back pain. The sacroiliac joints are synovial joints located between the irregularly shaped, articular surfaces of the sacrum and the ilium. The left and right sacroiliac joints function to transmit ground reaction forces from the lower extremities to the vertebral column. 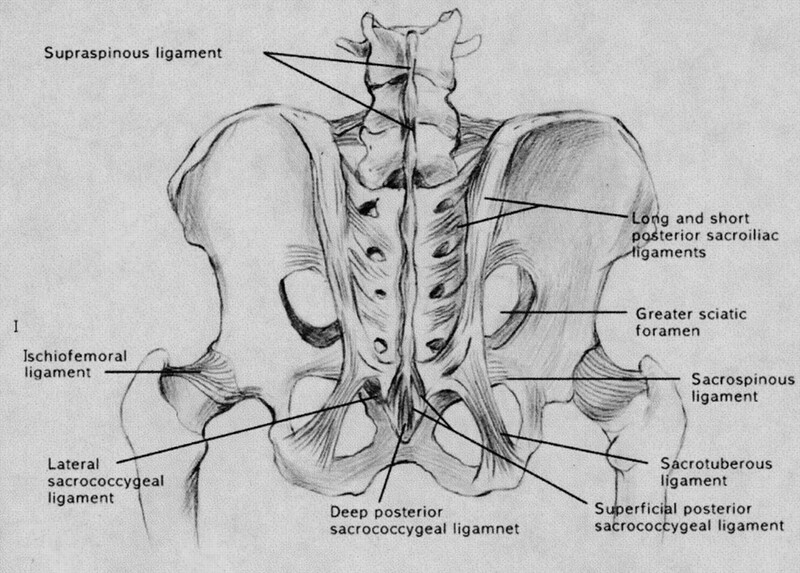 As a necessity of function, each SIJ is designed for stability, which is provided by the unique interlocking fit of the articular facets and three primary ligaments: the anterior sacroiliac ligament, the interosseous sacroiliac ligament, and the posterior sacroiliac ligament. Although there are no muscles that directly influence movement of the SIJ, certain muscles such as gluteus maximus, piriformis, and biceps femoris indirectly influence SIJ mobility due to functional ligamentous connections. During pregnancy, women experience an increase in the hormone relaxin, which contributes to increased ligamentous laxity to facilitate parturition. With age, the sacroiliac joints become fibrous. These fibrous changes to the articular surfaces of the sacrum and the ilium begin during adolescence and speed up by the fourth decade of life. By the sixth decade, capsular mobility of the SIJ is restricted. These degenerative changes are a naturally occuring part of life, and may eventually cause complete ossification of the SIJ. Sacroiliac joint dysfunction commonly affects women more than men, with an incidence of between 15% and 38% in the general population. During pregnancy, the prevalence of posterior pelvic pain, which is pain located distally and laterally to the lumbosacral junction, is approximately 20%. Because the symptoms of sacroiliac joint dysfunction may mimic many other pathologies, differential diagnosis including provocation and diagnostic testing is key to successful treatment. In their 2003 review, Hansen and Helm outlined many of the potential causes of sacroiliac joint dysfunction, which are represented in the table below. The gold standard for diagnosis of intra-articular sacroiliac joint pain is the anaesthetic block. Performed under fluoroscopic guidance, this test is administered by injecting contrast enhanced anaesthetic into the painful area of the sacroiliac joint. Common anaesthetics used in sacroiliac joint blocks are Lidocaine Hydrochloride and Bupivacaine Hydrochloride. Diagnosis is confirmed when the patient experiences relief from pain. This diagnostic test can double as a treatment method when corticosteroid is injected into the painful sacroiliac joint in addition to the local anaesthetic. Treatment of sacroiliac joint dysfunction in the acute stage might involve the use of cryotherapy, anti-inflammatory medication, and rest, which will aid in decreasing inflammation and pain in the affected area. Although the eventual goal is to restore normal mechanics, pelvic stabilizers such as SIJ belts, water-resistant tape, and three-point pelvic stabilization orthoses can provide the patient with increased proprioceptive awareness and confidence. To decrease long-term reliance on orthotics, conservative treatment may also include pelvic stabilization exercises that increase dynamic postural control and muscle strengthening of the two joint muscles around the SIJ. Plyometric exercises can be introduced in the final rehabilitation stages of SIJ dysfunction, but only after the patient has demonstrated pelvic control during non-impact dynamic movements. Transcutaneous electrical nerve stimulation (TENS) is used in patients with SIJ dysfunction to reduce pain. Coventional, or high-rate TENS, reduces pain by taking advantage of the gate control theory of pain. Low-rate, or acupuncture-like TENS, reduces pain by stimulating the production and release of endorphins. Burst mode TENS reduces pain similarly to low-rate TENS except that the electrical stimulation is delivered in bursts, which may make the treatment easier for some patients to tolerate. TENS is delivered through strategically placed electrodes. Cameron 2009 states, "If two channels, and thus four electrodes are used, the electrodes can be placed to surround the area of pain. The two channels can be placed so that they intersect, allowing the current to cross at the area of pain or they may be placed parallel, either horizontally or vertically. The two channels must intersect if an interferential current is desired. If one channel and thus two electrodes are used, placement around the painful area is most common." Sacroiliac joint belts are used in patients with SIJ dysfunction to provide compression and reduce SIJ movement in hypermobile or weak patients. According to Cusi 2010 the SIJ belt is best utlized in the early stages of rehabilitation. Although the belt may be worn when the patient is performing sedentary activities, it is best used during walking and standing activities when more stabilization is required. Proper positioning of the SIJ belt is posteriorly across the sacral base and anteriorly below the anterior superior iliac spines. There are two main surgical procedures associated with sacroiliac joint dysfunction. The first procedure is a SIJ denervation, which works well for patients who respond favorably to the anaesthetic nerve block. In this procedure, a radiofrequency probe is used to cut the sensory nerves to the SIJ. Damage to surrounding structures is minimal because fluoroscopic or CT guidance of the probe is utilized. The second surgical procedure associated with sacroiliac joint dysfunction is SIJ fusion, which is often used in patients with dislocation or fracture dislocation of the joint. One safe and reliable method for SIJ fusion is percutaneous iliosacral fixation with screws or bars. Like the SIJ denervation, the SIJ fusion is performed under fluoroscopic or CT guidance. 1. Dreyfuss P, Michaelsen M, Pauza K, McLarty J, Bogduk N. The value of history and physical examination in diagnosing sacroiliac joint pain. Spine. 1996;21(22):2594-2602. http://www.kalindra.com/dreyfuss.pdf. Accessed November 28, 2010. 2. Laslett M, Young SB, Aprill CN, McDonald B. Diagnosing painful sacroiliac joints: a validity study of a McKenzie evaluation and sacroiliac provocation tests. Aust J Physiother. 2003;49(2):89-97. http://ajp.physiotherapy.asn.au/AJP/49-2/AustJPhysiotherv49i2Laslett.pdf. Accessed November 26, 2010. 3. Neumann DA. Kinesiology of the Musculoskeletal System. 2nd ed. St Louis, MO: Mosby; 2010. 4. Drake RL, Vogl AW, Mitchell AWM. Gray’s Anatomy for Students. 2nd ed. Philadelphia, PA: Churchill Livingstone; 2010. 5. Mitchell DA, Esler DM. Pelvic instability - painful pelvic girdle in pregnancy. Aust Fam Physician. 2009;38(6):409-410. http://www.racgp.org.au/afp/200906/200906mitchell.pdf. Accessed November 28, 2010. 6. Cohen SP. Sacroiliac joint pain: a comprehensive review of anatomy, diagnosis, and treatment. Anesth Analg. 2005;101(5):1440-1453. http://www.anesthesia-analgesia.org/content/101/5/1440.full.pdf+html. Accessed November 26, 2010. 7. Frontera WR, Silver JK, Rizzo TD Jr. Essentials of Physical Medicine and Rehabilition: Musculoskeletal Disorders, Pain, and Rehabilitation. 2nd ed. Philadelphia, PA: Saunders; 2008. 8. Ilaslan H, Arslan A, Koc ON, Dalkilic T, Naderi S. Sacroiliac joint dysfunction. Turk Neurosurg. 2010;20(3):398-401. doi: 10.5137/1019-5149.JTN.2612-09.2. 9. Standard of Care: Posterior Pelvic Pain in Pregnancy. Brigham and Women's Hospital Web site. http://www.brighamandwomens.org/Patients_Visitors/pcs/rehabilitationservices/Physical%20Therapy%20Standards%20of%20Care%20and%20Protocols/Pelvis%20-%20Posterior%20Pelvic%20Pain.pdf. Accessed December 1, 2010. 10. Hansen HC, Helm S II. 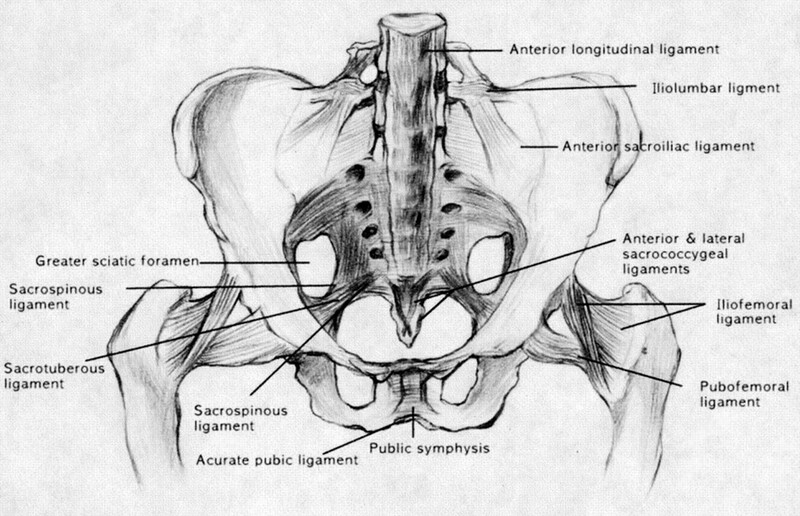 Sacroiliac joint pain and dysfunction. Pain Physician. 2003;6(2):179-189. http://www.painphysicianjournal.com/2003/april/2003;6;179-189.pdf. Accessed November 29, 2010. 11. Laslett M. Evidence-based diagnosis and treatment of the painful sacroiliac joint. J Man Manip Ther. 2008;16(3):142-152. http://www.ncbi.nlm.nih.gov/pmc/articles/PMC2582421/pdf/jmmt0016-0142.pdf. Accessed December 2, 2010. 12. Laslett M, Aprill CN, McDonald B, Young SB. Diagnosis of sacroiliac joint pain: validity of individual provocation tests and composites of tests. Man Ther. 2005;10(3):207-218. doi:10.1016/j.math.2005.01.003. 13. Magee DJ. Orthopedic Physical Assessment. 5th ed. St. Louis, MO: Saunders; 2008. 14. Hansen HC, McKenzie-Brown AM, Cohen SP, Swicegood JR, Colson JD, Manchikanti L. Sacroiliac joint interventions: a systematic review. Pain Physician. 2007;10(1):165-184. http://www.painphysicianjournal.com/2007/january/2007;10;165-184.pdf. Accessed November 28, 2010. 15. Forst SL, Wheeler MT, Fortin JD, Vilensky JA. The sacroiliac joint: anatomy, physiology and clinical significance. Pain Physician. 2006;9(1):61-67. http://www.painphysicianjournal.com/linkout_vw.php?issn=1533-3159&vol=9&page=61. Accessed December 2, 2010. 16. Cameron MH. Physical Agents in Rehabilitation: From Research to Practice. 3rd ed. St. Louis, MO: Saunders; 2009. 17. Prather H. Sacroiliac joint pain: practical managment. Clin J Sport Med. 2003;13(4):252-255. http://www.ncbi.nlm.nih.gov/pubmed/12855929. Accessed March 10, 2011. 18. Cusi MF. Paradigm for assessment and treatment of SIJ mechanical dysfuntion. J Bodyw Mov Ther. 2010;14(2):152-161. doi:10.1016/j.jbmt.2009.12.004. 19. Zelle BA, Gruen GS, Brown S, George S. Sacroiliac joint dysfunction: evaluation and management. Clin J Pain. 2005;21(5):446-455. http://www.med.nyu.edu/pmr/residency/resources/general%20MSK%20and%20Pain/sacroiliac%20jt%20dysfxn-eval%20and%20management.pdf. Accessed December 2, 2010.